Iowa State University president Stephen Leath indicated today that UNI coach Ben Jacobson is not on the list to replace Cyclone men’s basketball coach Fred Hoiberg. Hoiberg left Ames to take over as coach of the Chicago Bulls. 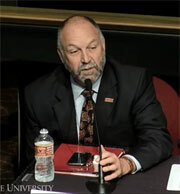 During the Board of Regents meeting in Ames, Leath talked about the coaching vacancy. Leath says they are looking for a basketball coach and says he has assured UNI president Bill Ruud that they are not looking to take his coach. “We are going to be good partners,” Leath says. Leath is conduction the search for Hoiberg’s replacement along with athletic director Jamie Pollard. “Fred Hoiberg did a great job for us, he is an Iowa State alum, elevated the program, and is the right kind of coach. And we’re thrilled that he is getting to realize his main career goal — which is to be an NBA coach. So, Jamie and I are working hard and we will get someone who is the right fit for Iowa State, and we hope to have that process completed fairly soon,” Leath says. Pollard released a statement following the announcement of Hoiberg’s departure that the search will be kept confidential.